Indian Railway recruits for Assistant Loco Pilot and Technician Post through common written examination for both categories held on the same day by all Participating RRBs. Selection is made strictly as per merit on the basis of written examination. The standard of the question for the written examinations will be generally in conformity with the educational standard and/or minimum technical qualification prescribed for the posts. The question will be of objective type with multiple choice and are likely to include questions from General Awareness, Arithmetic, General intelligence & reasoning, General Science and Technical Ability. Duration of the examination will be 90 minutes with approximately 100 to 120 questions. There shall be negative marking in written examination and marks shall be deducted for each wrong answer @ 1/3rd of the marks allotted for each question. Candidates who opted for ALP only / ALP and Technician will be shortlisted as per the performance in the written examination. Candidates who are in the merit list of ALP will be called for aptitude test / Psychological Test. We at eRForum.Net provide you the complete preparation strategy of LOCO PILOT / Assistant LOCO PILOT & Technician Exams for both written and Aptitude Test. In this post, we are sharing some Model Paper / Previous Paper of this exam. 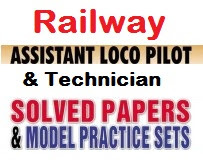 Download these model paper, get the idea of exact exam pattern and prepare well for upcoming ALP (Assistant Loco Pilot) / Loco Pilot and Technician Exams. You can also find Model Paper ofAptitude Test / Psycho Test here. These Model papers are prepared according to the previously asked paper of RRBs for the post of ALP/Technician. # More Previous Solved Paper will be updated soon... Keep visiting this post regularly. If you have any further query related to this exam please ask through comment we will clarify your doubt as soon as possible.